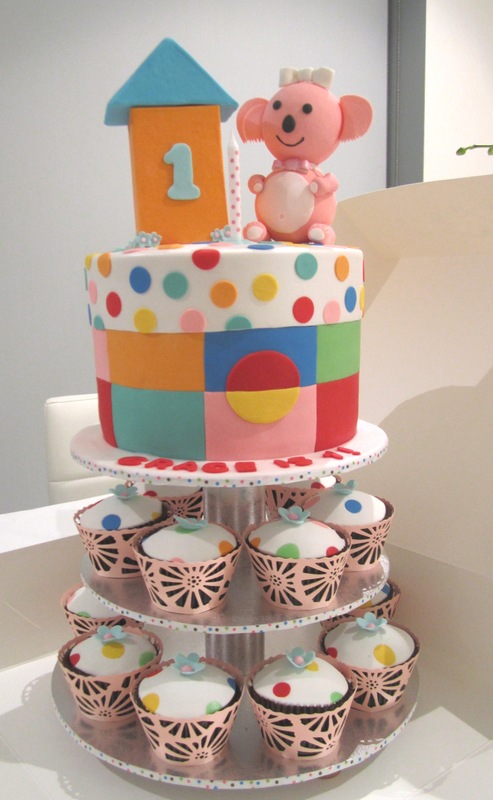 Ok so I don’t know if this was trying to do too much… but 2 toppers, 12 cupcakes and a cutting tier in the same week my mum slipped at work, broke her wrist and got an operation as well as packing and preparing for a trip to Perth for was probably taking on just a little too much. I made a resolution last year to keep things balanced and to only do 1 major project or “day out” each week so I wouldn’t overload myself. It’s only February and I’ve already broken this one in spades!! 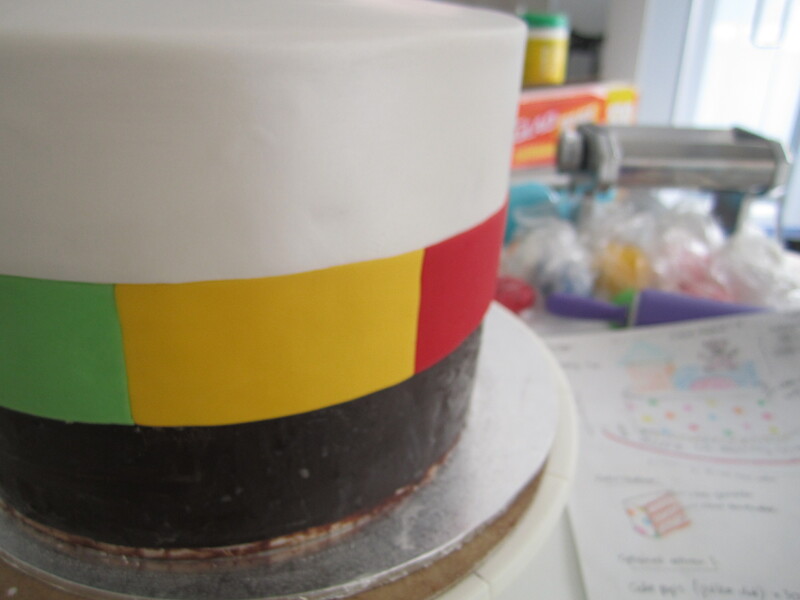 Nevertheless, I still tried to make time to enjoy being in the moment while making this cake despite all the visits to the hospital to see mum and frantically running around like a madwoman getting supplies for my trip to Perth. I can describe this one as fun but tedious.. and I only really have myself to blame for the tedious part! 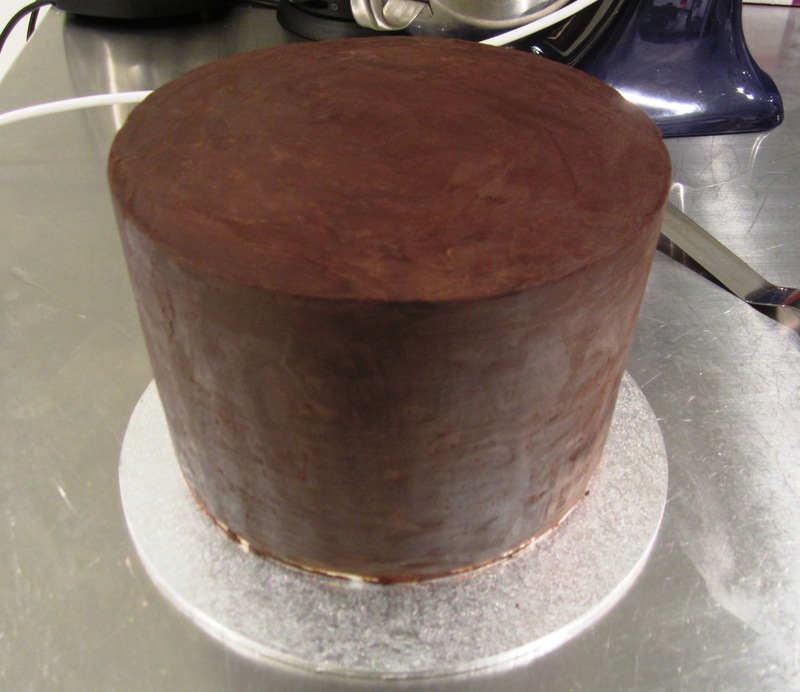 This cake was for a friend who also happens to be my husband’s boss’s partner, Carolyn,…. so it had to be a good one. 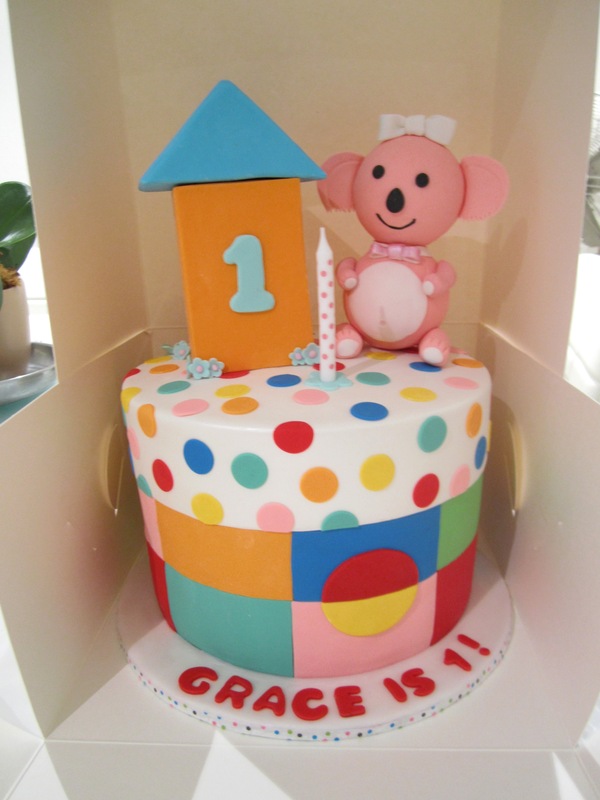 Carolyn wanted a 1st birthday cake for her gorgeous little girl, Grace, and the partygoers were the ladies in Carolyn’s mother’s group. 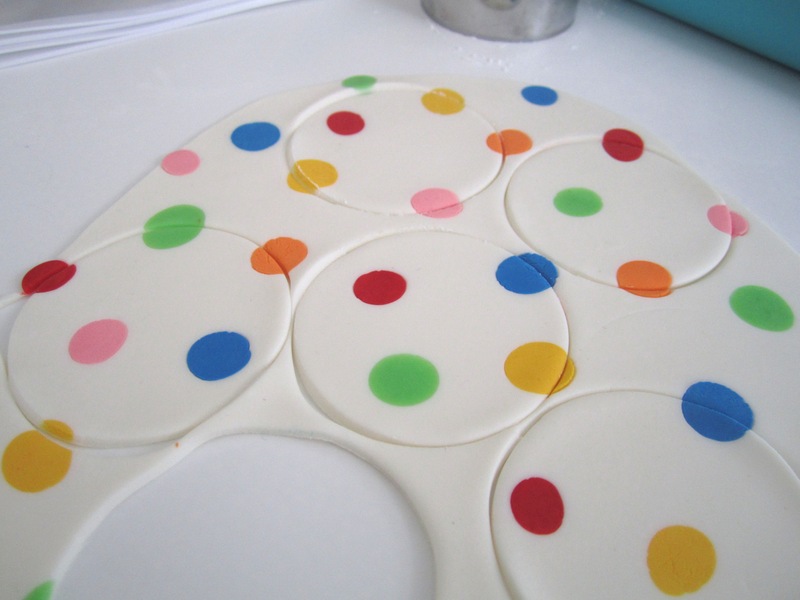 I also love using stationery as inspiration as the designs are often so interesting and easily translatable to cake designs. 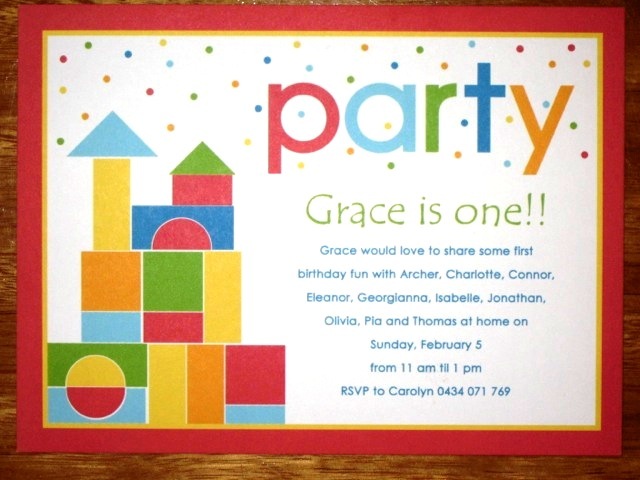 Little birthday girl Grace’s mum chose this “Castle Walls” invite from Tiny Prints. 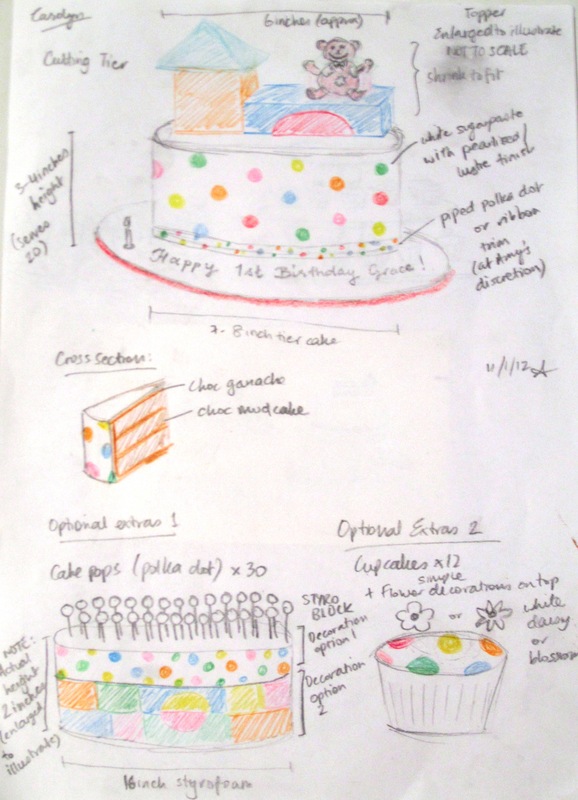 So I sketched up this design and went all out with a top tier, cupcakes and a covered dummy tier to hold cake pops. 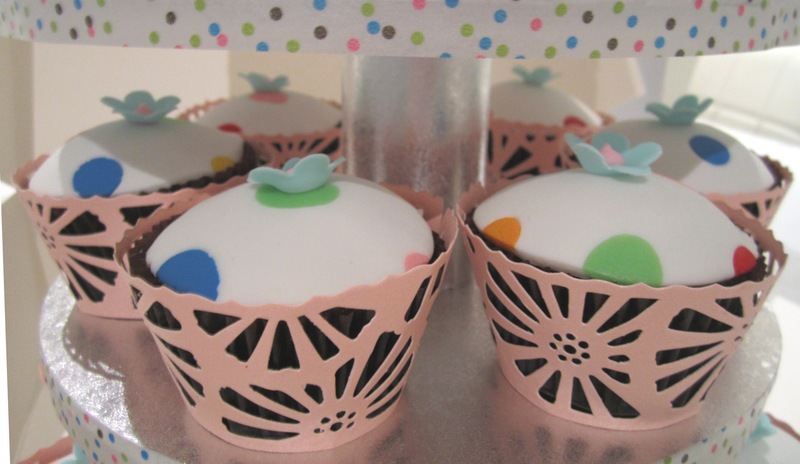 In the end you can see that the design was adapted and scaled back to suit a 3 tier cake stand and I also added a touch more pink with the cupcake wrappers which were from Martha Stewart’s range. 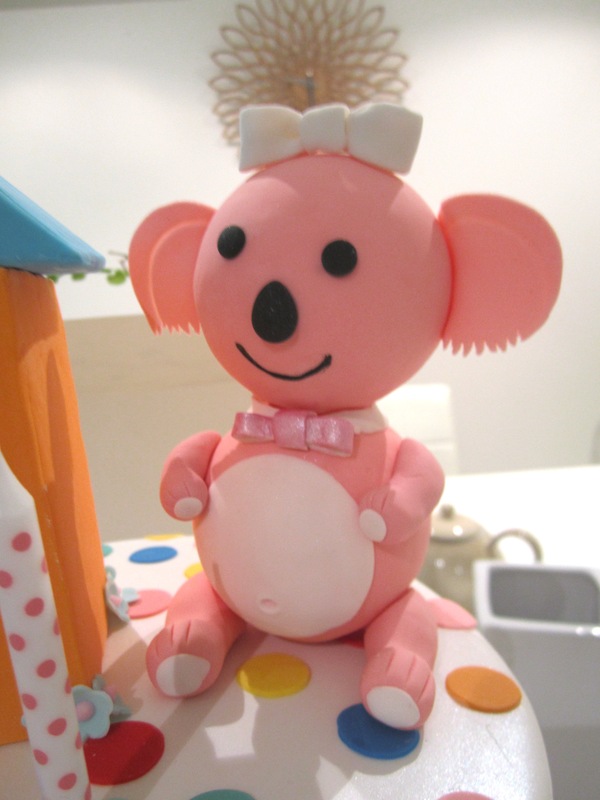 The little castle topper which is colour matched to the invitation and a hand made number “1” is an extension of the bottom two thirds of the cake to give the cake a little more likeness to the original invitation castle and I also had to remove the base that the koala was sitting on to keep things a little more balanced on top of the cake. 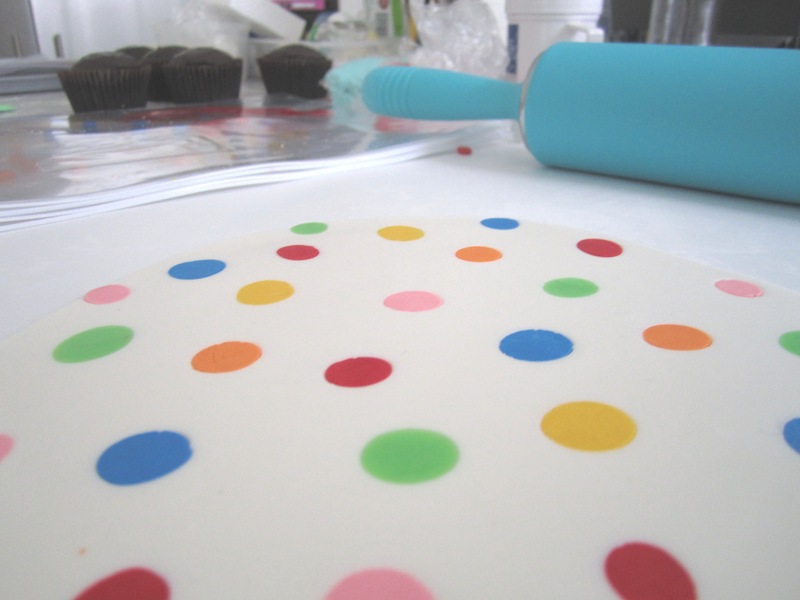 Here’s a mini gallery that shows the evolution of the top tier – really simple but effective techniques of half covering a round and then individually pasting on each colour matched panel followed by applying polka dots cut out with a piping tube. 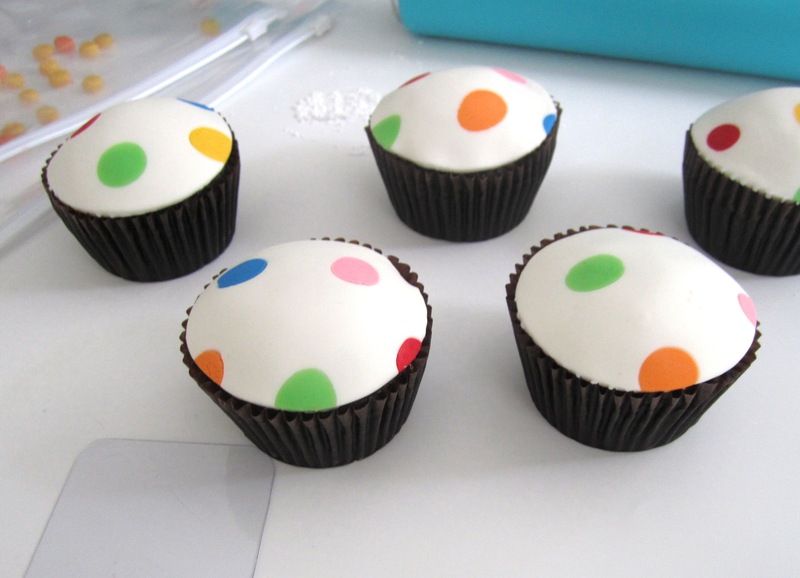 The cupcakes were fun but a little tedious. 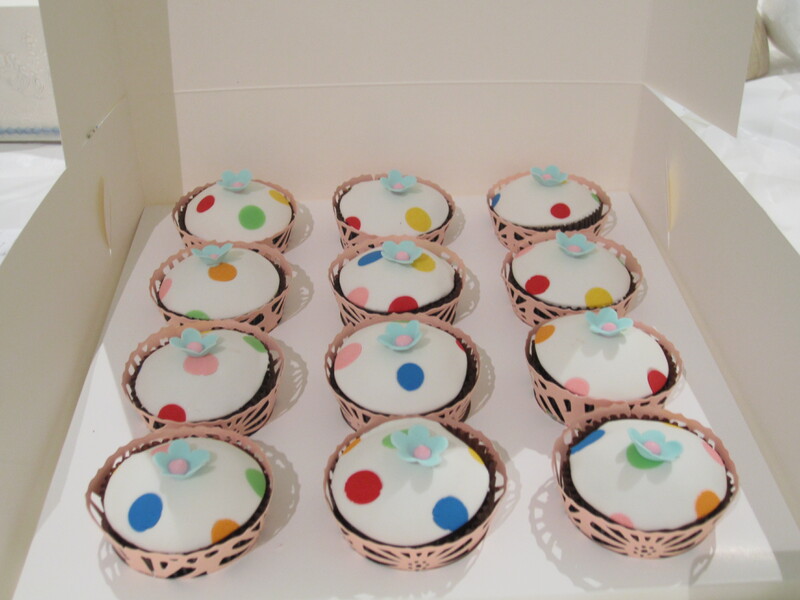 To achieve the polka dot effect I rolled lots of tiny coloured balls to create the polka dot effect on each cupcake. 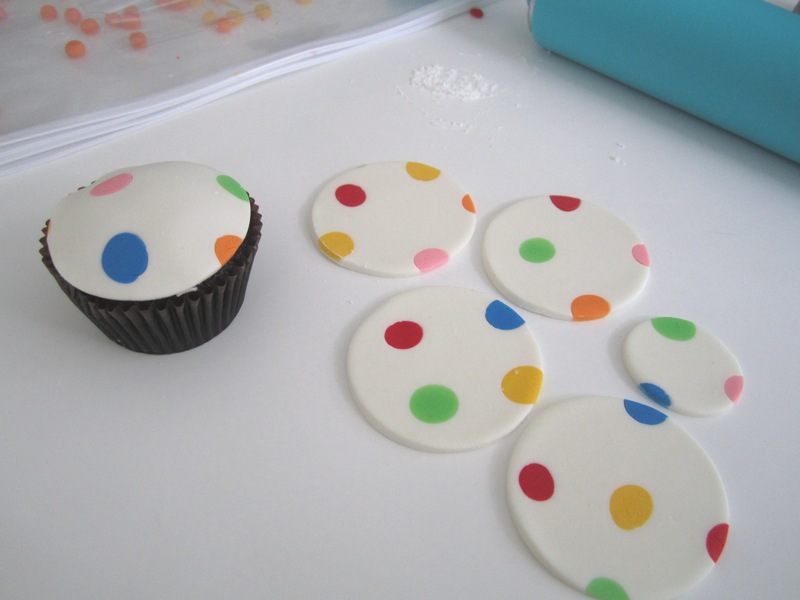 Strategically cutting the circles to get a variety of colours as well as placement of little balls of coloured sugarpaste were important steps in achieving this festive effect. 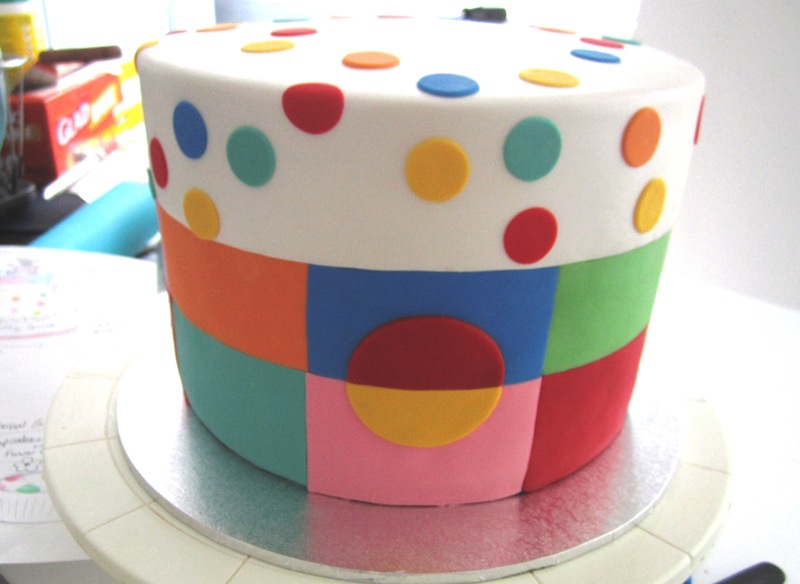 This was my last big order before I headed to the convention… coming up soon – a glamour finished cake with Faye Cahill, freehand “lalique” piping with Jean Michel Raynaud and a baby castle with Debbie Brown… stay tuned! !